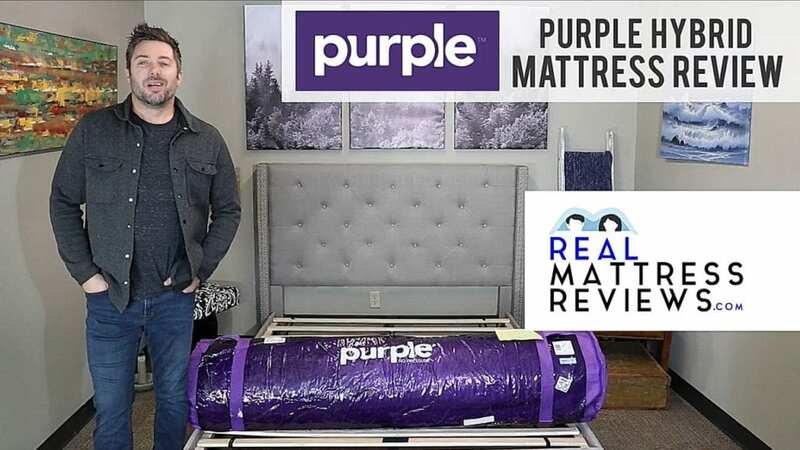 Purple Hybrid Mattress Review | The future of mattresses? Introducing Purple Mattresses New Hybrid design. Offered in 3 versions with the famous purple hyper elastic grid in different thicknesses. This mattress is sure to create a buzz. We look forward to reviewing it soon. 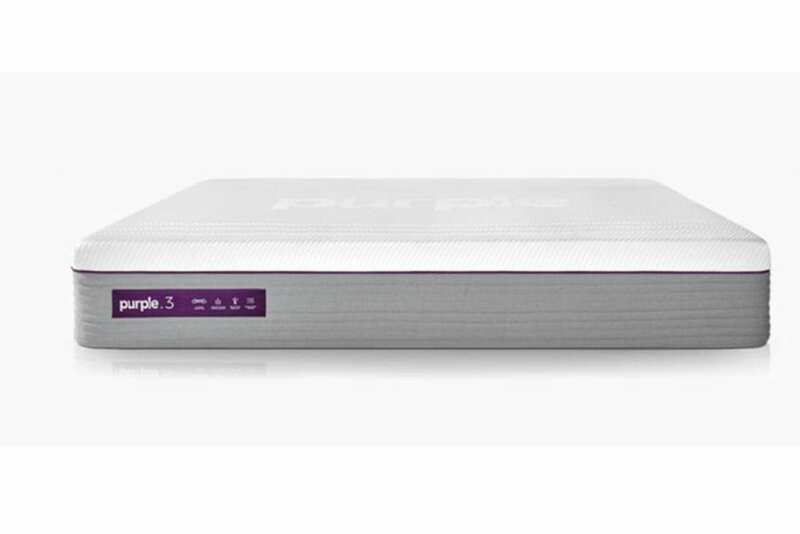 Famed bedding company, Purple, have released a new range of beds in a follow up to the popular, original Purple mattress. The new Purple comes in three different options, handily named the Purple 2, 3 and 4. These new models use the same technology, just in different amounts. All three are hybrid mattresses, while the original purple did not use coils. 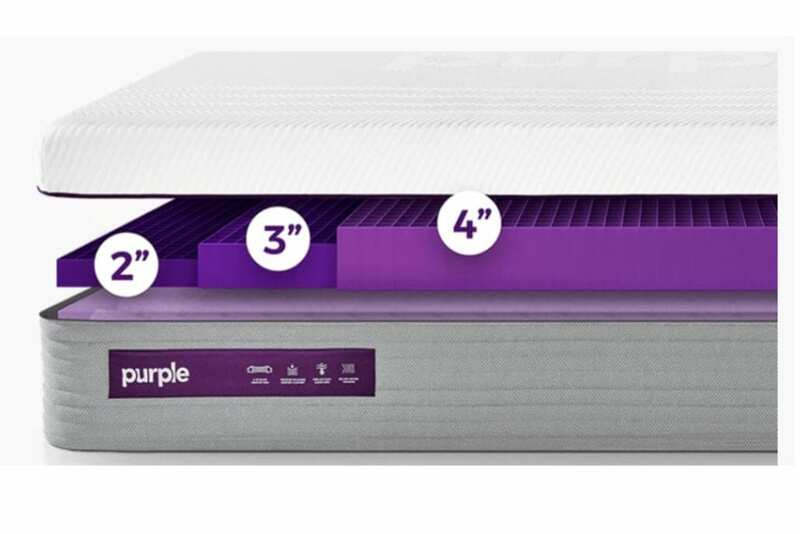 For the duration of this review, we shall refer to the Purple as one mattress, and point out the differences between the three models where appropriate. 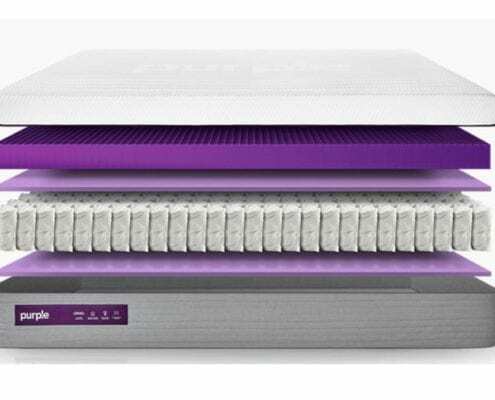 The unique selling point of the mattress is Purple’s patented use of the Smart Comfort Grid – an open lattice of polymer material which takes the place of traditional foam. The Smart Comfort Grid is unlike anything you’ve ever seen in a bed before. In addition to its unique appearance, it also contains a unique structure which outperforms traditional memory foam in many respects. 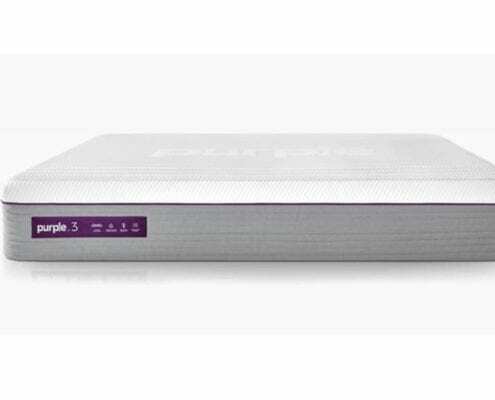 In addition to their trademark polymer, Purple have also introduced hybrid technology to their new mattress, adding 7.5-inches of individually wrapped coils. This merging of coil and polymer technologies is the first of its kind, and presents an intriguing addition to the premium bed market. People are understandably hesitant to take a chance with new technologies, so it makes sense to get to know the mattress before you buy it. So, read on, and benefit from our in-depth breakdown of the new Purple Mattress. Purple burst onto the mattress scene in 2016 and saw wild growth with their infamous hyper elastic grid. You may have seen the Goldilocks commercials and Egg Tests to demonstrate pressure relief. They are back with a luxury hybrid available in 3 different thicknesses and price points. The Purple.2, Purple.3 and Purple.4 all offer a solid coil unit with varying thicknesses of polymer. This creates three ideal feels for every sleepers preference and hits 3 price points. Purple has gained a very strong following with the original and many are excited to try the hybrid. The Smart Comfort Grid is doing the most work when it comes to comfort, and is going to be responsible for the feel of the mattress, whether you like it or not. Some buyers have noted that you can feel the polymer grid when you lie down on the mattress. However the same buyers also say that after getting used to it, they found it to be so comfy that they stopped noticing. As with any new technology, using polymer will come with its own special characteristics. More will be made of the polymer grid in the ‘Materials’ section of this review, but for now, let me say that it provides a unique, responsive feel to the surface of the mattress. The polymer allows you to sink in up to a point, before the overall structure of the lattice steps in to halt the sinkage and provide support. These two jobs, usually done by foam+foam, or foam+springs, are both done effortlessly by the Smart Comfort Grid at once. For anyone who’s sceptical of the polymer’s ability to provide capable support – fear not, because the pocketed coil layer doubles up on the support, while also retaining reflexivity thanks to their individual wrapping. As mentioned before, the Purple comes in three different forms, each slightly different to the other. The Purple .2 has 2-inches of the polymer grid, and is recommended for those who prefer a firmer sleep. The Purple .3 has 3-inches of polymer grid, and is marketed as the ‘sweet spot’ for combination sleepers. The Purple .4 has 4-inches of polymer grid, and is a super-soft model, especially recommended for side-sleepers. This model is hailed as delivering a ‘zero gravity sleep’, and it’s easy to see why. 4-inches of polymer make room for incredible snugness. You will definitely sink in to this bed, particularly if you’re on the heavier side. Those who are lighter or more petite will experience less ‘sinking in’, due to the reactive but structured nature of the grid, so keep this is mind when considering your preference. 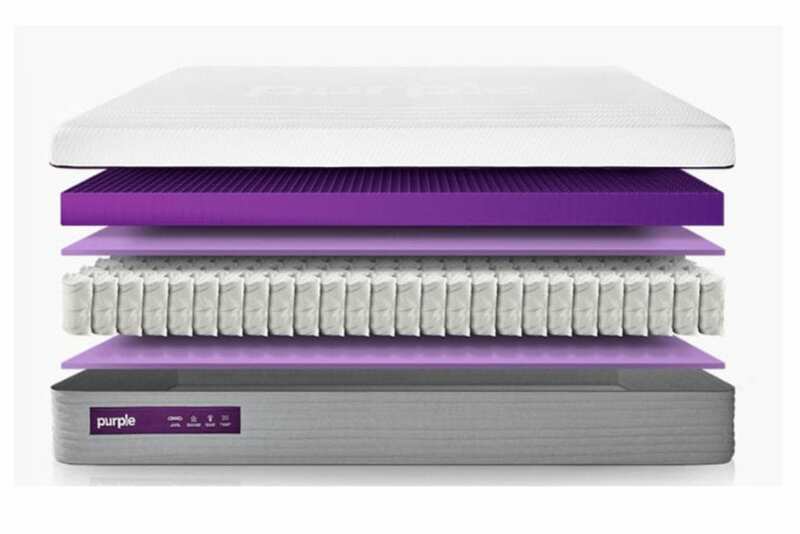 With the choice of three firmness options, each utilizing the unique Smart Comfort Grid, the Purple mattress ticks a lot of boxes when it comes to comfort. Delivery of the Purple Mattress is FREE, and should arrive at your door within 3-7 days of placing your order. Purple also offer a free White Glove delivery service, where they do all the heavy lifting for you. They will unpack and set-up your new mattress in your desired room, and dispose of the packaging. If you choose, they will also remove your old mattress for you, meaning you’re good to go as soon as your bed arrives. If you choose to set it up yourself, just be careful not to damage the fabric when cutting the mattress from its wrappings. And be sure to move the boxed bed into your desired room before opening it, as it will expand quickly and become much more awkward to manoeuvre. Products are manufactured and shipped in the USA, and come with delivery tracking so you can keep an eye on your order. Set-up of the Purple mattress is simple enough. The fact that it’s free is a bonus. While the free White Glove delivery service is a nice touch that many will find useful. To avoid off-gassing, open the bed from its packaging as soon as it arrives. Keeping it in the box will likely concentrate the smells of the packed materials. Some people don’t realize off-gassing is a thing. You wouldn’t say a new book shows signs of off-gassing, even though there is actually a ‘new book smell’. Likewise, some people notice a new mattress smell, and refer to this as off-gassing. If you are particularly sensitive to new furniture smells, just stand the mattress up in a well ventilated room and allow it to air out for around 24-36 hours. By this time any scents or odours should be completely gone. Mattress protectors and sheets can then be applied and any smells from the fabric of your mattress will be undetectable. Purple use certified materials, made in the USA, and off-gassing isn’t a major problem for this mattress. Short delivery time also helps avoid off-gassing. Let’s examine the headline grabbing material first of all – the polymer of the Smart Comfort Grid. The Purple website is full of demonstration videos showing the elastic and unbreakable nature of the hi-tech polymer. Purple make bold claims about this material’s ability to absorb pressure without weakening, and they have scientific data to back up their claims. For a full rundown on the structure of the polymer, see the manufacturer’s website. For now, just know that this stuff is highly malleable and yet seemingly unbreakable. The luxury bedding market may be seeing more of this material in the coming years given the popularity of the Purple. Beneath the Smart Grid is a layer of Specialized Comfort Foam, which acts as the transition layer between the polymer and coil layers, while also extending out to the edges to aid in providing edge support. Then we have the Responsive Support Coils – a layer of 7.5-inch springs which are individually wrapped to allow for accurate and specified response. This means the coils can move along with the other layers of the bed, and reduces motion disturbance in the process. Next is another layer of Specialised Comfort Foam which acts a flexible, reactive base for the coil-system to rest upon. All of this is encased in Plexus Side Panels, which are made from a breathable, mesh-based material, allowing air to flow comfortably throughout. The main selling point here is the polymer grid, and the Purple deserves much of its praise for this alone. The rest of the bed is also smartly constructed using modern materials and scores high in this section. Tons of info coming soon! A quick glance at the open, latticed grid structure of the polymer layer should tell you a thing or two about the Purple’s ability to regulate temperature. Unlike memory-foam, which relies on claims of ‘breathability’, the polymer grid is a completely open design which allows air to literally flow through the structure of the bed. Meanwhile, the pocketed coil layer is also open in its structure, so what we have here is a bed with maximum airflow capabilities – possibly the most out of any mattress on any market. The polymer layer holds no heat whatsoever. The transition layers of foam are breathable in construction, and are also thin enough to not become heat-traps. The mesh side-panel is also highly breathable and gives form to the mattress while also allowing air to flow. Overall, the Purple breaks new ground when it comes to temperature regulation, with its remarkably open design. There’s no danger of heat-trapping, unlike in beds that primarily use foam. The use of the polymer also means that there is no need for gel or copper-infused layers. Well, this is a hybrid and so probably isn’t going to be breaking records for motion reduction, at least not compared to all-foam mattresses. 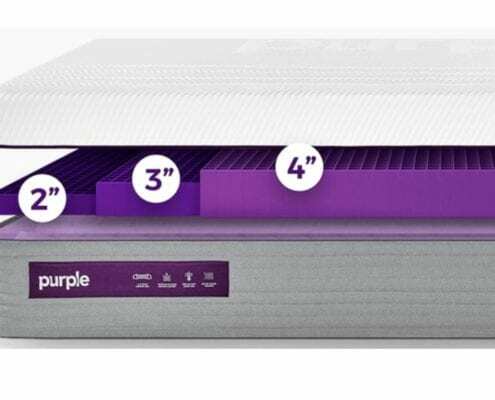 One thing that can be said for the Purple is that the coil layer is cushioned on both sides by ultra-durable polyurethane foam, while the mesh side-panel and generous edge-support foam also work to create a compact unit which only moves as much as it has to. However, the Smart Comfort Grid also comes in to play here, as the lattice structure allows for motion isolation, and means that the bed will only react where you need it to. Each little square in the grid structure can react on its own, so even though this is a hybrid, the polymer does somewhat mimic the effects of traditional memory-foam. Ultimately, the polymer is a little more reactive than memory-foam, and doesn’t achieve complete and total motion isolation. But it presents no particular issues, and performs better than most hybrids out there. The Purple has a few things going for it when it comes to edge support. The first thing to know is that the mattress comes with an extra foam frame around its rim. This, in combination with the coil layer, and mesh side-panels, creates a fairly solid consistency around the edges. Given the reactivity of the polymer grid, it’s unsurprising that Purple elected to include a reinforced foam layer around the sides. The polymer would be far too malleable on the edges compared to foam. However, unlike foam, the polymer material will never deteriorate over time, and is not capable of forming indentations. Additionally, the coil layer provides more all-round support than would be found on an all-foam mattress, so edge support is helped here from several different angles. The Purple does well to create an equilibrated surface that doesn’t fall apart at the edge. The Purple Hybrid will work splendidly on an adjustable base. The 100-night free sleep trial offered with the mattress is expected these days, and the Purple doesn’t disappoint. If you decide you don’t like the mattress within this time period, Purple will pick up the mattress and give you a full refund. Purple also shift their mattresses with a 10-year warranty, so if you discover any manufacturer defects in this time they will repair or replace the mattress according to your wishes. For full details about the extents and limitations of the warranty, see the manufacturer’s website. Pillows, sheets and mattress protectors naturally have a shorter trial period and warranty than the mattress. The Purple .2 in queen-size currently goes for $1,599. The Purple .3 queen goes for $2,199. The Purple .4 queen goes for $2,799. At these prices, it’s clear we’re dealing with a high-end mattress. However, the use of the Smart Comfort Grid is a big attractor, and has resulted in thousands of sales. The Purple may carry a premium price-tag, but it really does have something unique to offer, and might just justify its cost in the long run. A good trial period and warranty also removes some of the risk involved in making a purchase. Financing can also be arranged on the Purple website, while mattresses are currently shipping out with a free Purple pillow while stocks last. We give the Purple Mattress 4.5 out of 5 for overall value and recommendation. Wants to sink in to the responsive Smart Grid. Needs a bed with wide-open materials which allow for unmatched air-flow. Wants a bed that won’t wear down and leave indentations like memory-foam. Would like the added security of dedicated edge-support. Is willing to take a chance on the advanced polymer grid.